Rebecca is on her way to success! My name is Rebecca and I recently decided to get my GED so I would be able to get hired into the company that I am working for as a temp. I contacted the York County Literacy Council for help with this. They helped me get a tutor for my studying. I spent about two months going thru the whole process. 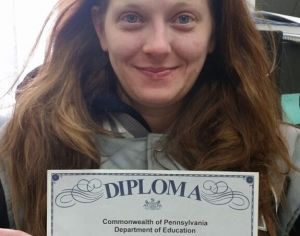 With all of the help the York County Literacy Council gave me, I was able to feel more confident about getting my GED. Once I took the tests, and later checked my scores, I cried from being so happy to be able to pass and build a future with the company I wanted to continue working for. Now, I am starting my new chapter in life as a company employee where I have been temping at for more than 2 years. I am receiving higher pay and full benefits.